How do I say yes to a wedding invite in some form of code or scripting language? I've been invited to the geekiest wedding ever. Two gamers, with a wedding cake based on an xkcd comic, one of them works with me and is responsible for coding a lot of the backend for our website, if that gives an indication for how geeky. I want to accept the wedding invite, and say so on the invite card in some kind of programming code or script, but fairly succinctly. IMPORTANT: MAKE IT PERFECT. If I get this wrong, I will never hear the end of it. Assume (correctly) that I know nothing about code. Going by yourself? wedding.attending["shmegegge"] = True; or wedding.attendees++; could work. I'm always a little confused with these requests... do you just want something that looks like code, and that includes the words "I cordially accept your invitation"? Or, do you want something really, decidedly clever that they have to actually compile and run to understand? The former is trivial, and painfully boring for anybody who reads code. The second is, perhaps, overly complicated just for saying "yeah, I'll be there"... and maybe they don't program (that particular language), and so won't be able to make hide nor hair of it. For the second one... well, how many lines/characters do we have to work with? something rather like lantius, BP and Jimbob's answers is basically perfect. Figure the most commonly known coding languages as the best bet. He knows a few, but I couldn't name which. sorry. This code says yes the first time and every time it is called. I'd draw a Venn Diagram. The union could be labeled "Attending X's Wedding." The left and right circles would be plays on how you know each other, interact with each other, or some other interests you share or don't share with each other. Okay, given your conditions, I'd vote for mhum's SQL. As clever as Blazecock's solution is, neither /bride nor /groom are standard unix files. And that rankles. PS: My last suggestion is basically a database update which adds your name (and your guest's name) to the table called "wedding_guests". I personally didn't mind that part (you can put it as /var/bride and /var/groom or /usr/bride and /usr/groom, if you like). Personally, I noticed that yes ignores input so it doesn't really make sense to put it at the end of a pipe. Replace foo with your first name and bar with your last. advicepig - you probably don't need sudo when the file is within your ~ (and xml is evil). I vote mhum's SQL but since they probably already have a table containing all the invitees you just need to UPDATE wedding_guests SET wedding_guests.attending = TRUE WHERE wedding_guests.firstname = 'your first name' AND wedding_guests.lastname = 'your last name' ... I'm not sure how to handle +1s... Probably need to add a wedding_guests record and track the host's ID with a wedding_guests.guest_of INT -- that way when if the original invitee cancels you can cancel their +1 as well. I'm sorry, but if you're going to do SQL, you'll have to work in a JOIN in there, somewhere. This should print "yes" to the screen under a UNIX-ish environment. I don't know what it does under Windows. And, yes, it can be argued that any perl is obfuscated perl. Yep. My answer is a bit less perfect than what you need, probably. How about add an XBOX portion, like this. Though I'm liking the SQL version myself. Maybe combine them? Another thought, maybe unix sysadminish? I'd go with the SQL, as if he/she's a webdev, they'll definitely understand it. I use to write poetry with C code and I always took liberties with the code to make it more readable for non-geeks and I think makes it a little more romantic but still with a geeky flavor. I always found real language syntax to be a bit restricting. Perhaps I wasn't a good enough coder! Don't reply; unix programs return zero on success. Mhum has given a pretty sweet answer that I'm sure a database/backend coder would get a kick out of figuring out. I'd go with that personally. This entire thread is a perfect example of why replying geekily but not naturally doesn't really work. What are you (asker) geeky about? Note that if you go with mhum's suggestion it's essential that if you have a name like O'Holleran with an apostrophe in it that you properly escape the quote. As to including a JOIN, that seems extraneous to me because you don't generally join on anything when doing an UPDATE or INSERT, although you could come up with a convoluted example where it would be necessary but I think that would just be making it needlessly complicated. If you sent him that line surrounded by backticks (`curl ... accept`), it might indicate to him the sense you are running it. Or it might make it imperfect. you guys are fantastic. I'm gonna take some time to figure out which one I'll end up using, but these are some elegant and creative solutions and I love you all. out of curiosity: I just sneakily determined what the groom spends most of his time coding in. (read: I asked him point blank "what code do you write in most of the time for work?") He said "php." any php related code that would do this? It's not a necessity, as the provided answers will absolutely work. 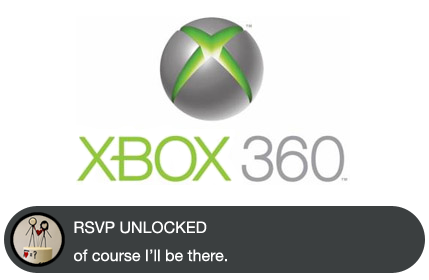 I will probably link him this thread for his amusement once I mail the RSVP card. You guys rock. To go in another direction. You could create a web page that simply says "shmegegge accepts your invitation." And on the reply card just print out a QR code that points to that site. Or, heck, just points to this thread. You have the option of accepting (True/False), and having a guest. The rest should just run through whats going to happen on the day. Feel free to add $marriage->objections if you so wish. Oh, and I think I got an Ace Attorney reference in there. Note: I couldn't be bothered to figure out how to handle polygamy, hence a wedding error if more than 2 participants are involved. update: I went with artlung's answer, here, and the response was enthusiastically positive. The couple in question were extremely pleased, and when I showed them this thread they were incredibly impressed with all the answers and the community in general. thanks everybody!